The Chihuahua (affectionately called 'Chi') may descend either from tiny, hairless Chinese dogs or the South American 'Techichi', a favored pet which was buried with the deceased in the hope they would lead the way to the afterlife. Modern Chihuahuas hail from Chihuahua, Mexico. They are the smallest dog breed and the oldest North American breed. They rocketed to popularity in the U.S when famous Latin musician Xavier Cugat made a Chihuahua his constant public companion, and remain extremely popular to this day. Famous Chihuahuas include the Taco Bell Chihuahua, Ren from 'Ren and Stimpy', and Ducky, the 2007 ‘Guinness Book of World Records’ winner for ‘World's Smallest Living Dog’. 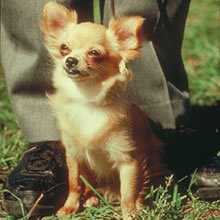 The Chihuahua has a shoulder height of 15-23 cm (6-9 in) and weighs 1-3 kg (2-5.5 lbs). Chihuahuas have an apple shaped head with a short, pointy muzzle, large erect ears, and tiny feet. The tail may curve over the back or side. The Chihuahua can have a long or short coat. A variety of colors are acceptable, including sand, chocolate, silver, chestnut, and blue. A variety of patterns including sable and masks are also possible. The variety of possibilities makes classification difficult. Chihuahuas are intelligent, graceful, and sometimes too brave for their own good. They usually bond with only one person and become highly devoted, frequently kissing the owner's face (with or without approval). The Chihuahua is reserved around strangers, and may attempt to defend their owner, usually with little effect. Chihuahuas are tenacious, proud, and very energetic. Chihuahuas are intelligent, graceful, and sometimes too brave for their own good. They usually bond with only one person and become highly devoted, frequently kissing the owner's face (with or without approval). The Chihuahua is reserved around strangers, and may attempt to defend their owner, usually with little effect. Chihuahuas are tenacious, proud, and very energetic. Chihuahuas can usually live with other dogs and cats without problem. They get along particularly well with other Chihuahuas. It is important to socialize the Chihuahua as a puppy to prevent overt aggressiveness. Small children may regard the Chihuahua as a toy, and their teasing can cause it to snap or bite. It is preferable not to leave the Chihuahua with children under the age of 12, unless they are well taught or supervised. You can find Chihuahua puppies priced from $130 USD to $6500 USD with one of our credible breeders. Browse through our breeder's listings and find your perfect puppy at the perfect price. Chihuahuas can usually live with other dogs and cats without problem. They get along particularly well with other Chihuahuas. It is important to socialize the Chihuahua as a puppy to prevent overt aggressiveness. Small children may regard the Chihuahua as a toy, and their teasing can cause it to snap or bite. It is preferable not to leave the Chihuahua with children under the age of 12, unless they are well taught or supervised. Chihuahuas require regular grooming with a brush and comb for their long coat. The Chihuahua’s claws must be kept trimmed, and its teeth must be checked frequently for tartar buildup. Chihuahuas get cold easily and should be kept in a warm environment. The small nose may cause wheezing or snoring. The Chihuahua should not be overfed. There is typically a soft spot on the top of the skull; this is normal and is usually closed by adulthood. The Chihuahua has a long life span at 14-18 years. Although they are usually not trained because of their small size, Chihuahuas are eager to learn. The Chihuahua may require patience and effort to housebreak; for this reason they are sometimes only paper trained. Chihuahuas can usually get all the exercise they need by running around indoors. If the dog becomes overweight it should be allowed to walk rather than carried from room to room. Chihuahuas may be taken for short walks but are not an outdoorsy breed. Chihuahua Puppies for Sale - Shipped Worldwide! Finding the right Chihuahua puppy can be dog gone hard work. PuppyFind® provides a convenient and efficient means of selecting and purchasing the perfect Chihuahua puppy (or Chihuahua puppies) from the comfort of your home, 24 hours a day, 7 days a week. Take advantage of our PuppySearch or leisurely browse our directory of hundreds of dog breeds, Chihuahua dog breeders, Chihuahua dogs for adoption, and Chihuahua puppy for sale listings with photos and detailed descriptions. Some Chihuahua puppies for sale may be shipped Worldwide and include crate and veterinarian checkup. Many Chihuahua dog breeders with puppies for sale also offer a health guarantee. With thousands of Chihuahua puppies for sale and hundreds of Chihuahua dog breeders, you're sure to find the perfect Chihuahua puppy.